Mexico and American Modernism, by Ellen Landau, Yale University Press, 2013. Professor Ellen Landau, March 15, 2013. Photo by John Crosse. Above is Case Western Reserve art history professor and noted Jackson Pollock and Lee Krasner scholar Ellen Landau and her new book "Mexico and American Modernism" posing in front of the recently opened restoration of Siqueiros' "America Tropical." The mural sits atop the old Plaza Art Center where Pauline Schindler curated the exhibition "Contemporary Creative Architecture" (see below) not long before Siqueiros' mural was completed. "Contemporary Creative Architecture of California" exhibition curated by Pauline Schindler, various West Coast venues, 1930-1932. "Mercedes Matter: A Retrospective" curated by Ellen Landau, Weisman Art Museum, Pepperdine Universtty, January 23-April 4, 2010. I met Professor Landau while reviewing the Mercedes Matter retrospective she curated at Pepperdine's Weisman Art Museum a couple years ago (see above). She is retiring at the end of the academic year and moving to L.A. this summer. She just gave a lecture on her new book at UC-Santa Barbara Art Museum and is also consulting with the Getty on their restoration of Pollock's mural (see below) he did for Peggy Guggenheim now owned by the University of Iowa. 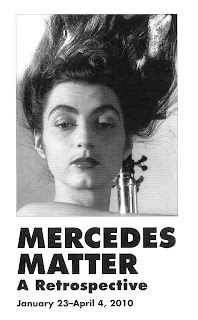 For much more on Ellen's work see my "Herbert and Mercedes Matter: The California Years." Mural, 1943, 97-1/4 X 236 in., Jackson Pollock. Don't forget to order a copy of Mexico and American Modernism which will be released next month, in fact you can preorder now at Amazon or Barnes & Noble. Landau graciously gave me a preview of the book over breakfast last Friday and it is definitely a must for any modern art lover. It goes into much more depth on the cross-pollination between the Mexican muralists and American artists such as Isamu Noguchi, Jackson Pollock, Philip Guston and Robert Motherwell than I touched upon in my "Richard Neutra and the California ArtClub" on which we compared notes. I hope to do a review of the book after it's release next month.